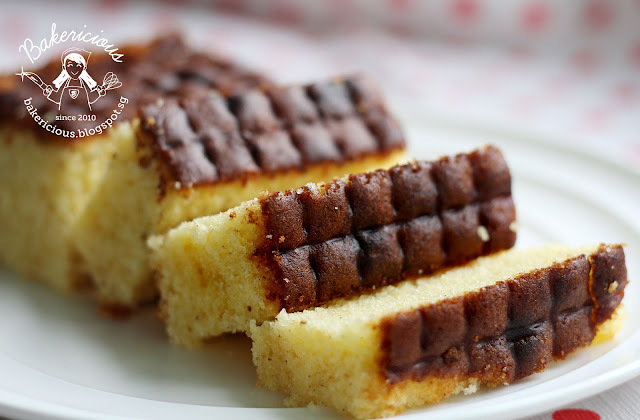 Butter cake is one of my favourite cake, I love those soft and fluffy butter cake especially. During my maternity leaves, my sis bought me a butter cake when she came and visited me. 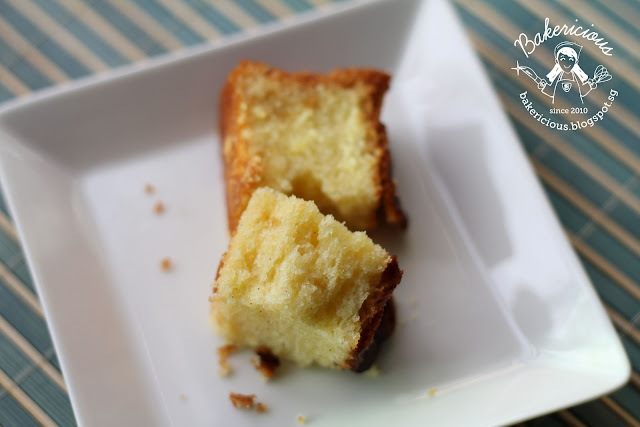 Wow, I fell in love with this butter cake immediately, so light, fluffy and soft and yet with nice buttery taste. Dear husband know that I love this butter cake so he drove all the way to this bakery shop to buy it for me, at least twice a week and each time, he bought 2 boxes of 6" cake. I can finished one cake by myself, in one day! Hahaha... horrible right. That is why my weight keep going up, I am even fatter than during my pregnancy :P.
When I saw this butter cake in Table for Two or More, I immediately bookmarked and swear to myself that I need to squeeze time to bake it soon. As usual, I didn't read the recipe properly. For step 5, it should be FOLD the balance eggwhites into the batter but I thought still using mixer to whisk. So I whisked the batter then realised should be FOLD, I stopped the mixer immediately and folded the batter. In my heart was thinking this cake is going to be ruined by me again since I done double work on the batter, I never good at egg seperated method :(. Luckily the cake still turned out good YAY! I remember Wendy mentioned that her cake turned dark during her last 15 mins of baking so I told myself I must go to check the cake after 30 mins of baking. I checked the cake after 25 mins, the cake top already turned dark, very dark :(. I quickly covered the top with aluminium foil. 2. Separate the eggs, and place the whites into a medium sized bowl. Beat egg whites until soft peaks, gradually add 50gm sugar and and beat until stiff. Set aside. 3. Cream butter and 150gm sugar until pale and fluffy. Scrape the vanilla seeds and and beat for a while. Put in egg yolks one by one and beat well after each addition. 5. Put half the egg whites in and mix on low speed. Pour the balance of egg whites in and FOLD. The cake is so soft, fluffy and moist, the vanilla seeds actually created some crunchiness bites for the cake. However only I can feel the crunchiness, no one actually realised it. I let dear husband tried and he asked "How come the cake so soft!" :) My colleagues given a thumb up for the cake too. The cake is a bit too sweet for me, I will need to reduce a little may be 10g sugar next time. This cake is delicious, definitely a keeper. Looks yummy! I have also bookmarked this recipe but have yet to try. Love ur new logo and photos and of coz the cake. I made this cake too I used 170g of sugar still find it little too sweet. In the past I used 190g of sugar for a standard size butter cake then over time I guess I eat less sweet , sugar amt drop to 180g, 175g...my current "level" is 160g. wowowo!!!! Your butter cake look fabulous! Oohh..i also bake this somewhere last week. Love this buttery cake so much. Thanks for trying this cake out. I think because the cake could've deflated a bit, it turned out sweeter. Great recipe! it is indeed moist and fluffy. My boys finished half of the cake in 10 mins. I have reduced 15 grams of sugar and it's prefect! thank you for sharing. Ya, this butter cake is very hot now..
Hi, came across your blog while surfing around. This looks really soft, moist and delicious. I wouldn't know that there was some mishap. Hi 茵茵, if you like butter cake, you must try this recipe, is good. Hi Angel, yup I will reduce the sugar next time to probably 160-170g. Hi Yee Ling, the cake taste great rite! Hi Wendy, I didnt know my cake deflated cos it still looks and tasted fluffy. Hi Anonymous, good that your boys also enjoy the cake, my gal only likes chocolate cake now. Hi Bee Bee, this is a must try recipe. Thanks Mich for dropping by. Jess, can you teach me how to create the logo watermark. TIA! Hi Jess, looks good and perhaps I will try one day. hi jess, eating the whole butter cake in a day? wow..how not to get fat like that? haha! your cake looks very very very nice and yes, your photo looks very god with your new camera!! Hi Jessie, do try it cos is really good recipe. err... what type of logo are you looking at? 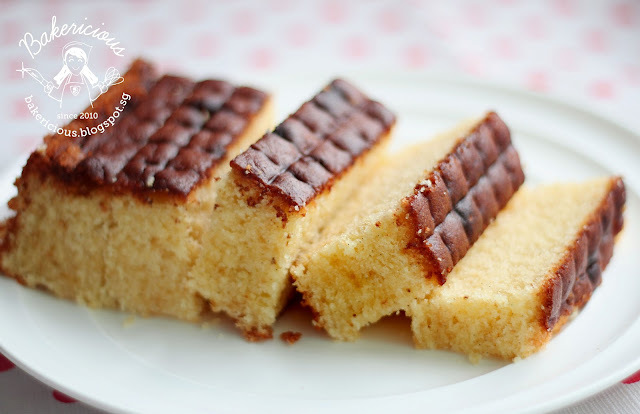 Hi Eileen, if you like butter cake dun hestitate, must give a try :). Jess, I'm referring to the watermark you created on your pics. What software to create and how to insert it in all the pics. TIA Jess! Hi Jessie, I will email you. Thanks for sharing MrsNgSK's butter cake recipe! I'm a novice baker; I bake only for special occasion or when I have explosive craving. But I tried this MrsNg receipe and it was a huge success! Egg separation was challenging but it DOES make a difference to the outcome of the cake. Butter cake is one of my childhood favs. Mom used to make delicious butter cakes for us during weekends. 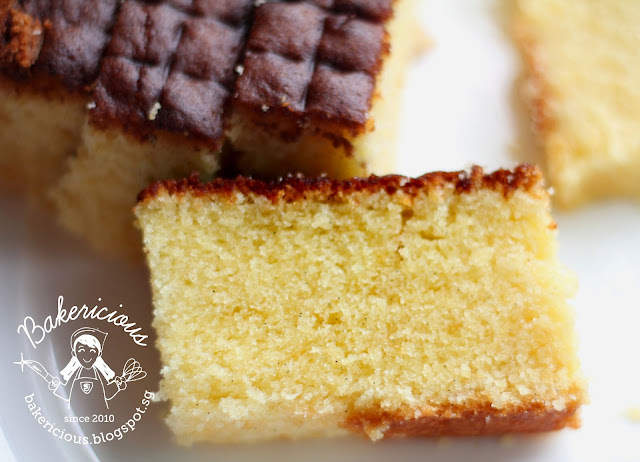 Home made butter cake is always better, perhaps it's because we do not compromise on ingredients (such using only SCS butter, which makes butter cake tastes especially yummy!). I hope to try other cake recipes you've posted. Thanks for your generosity in sharing your baking experience! !